I love SIMCO Drill rigs because they are a durable drill rig and very economical to run. I like the speed of the drill rig coming in and out of the hole. The 2×3 Centrifugal mud pump pressure and volume is one of the main reasons I bought the SIMCO 2800. 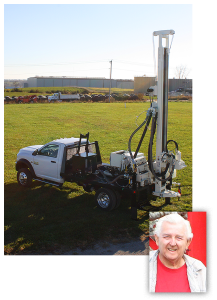 The rig is so easy to drive down the highway and roadways without all the DOT hassles of the large drills. I have drilled 500 ft. deep with the rig and the largest bore hole has been 12 inches in diameter. This rig is not lacking any power at all and was very well engineered!